The income statement is one of the four main accounting statements. The statement shows the profitability of a business over an accounting period. The accounting period can be any length but is usually a month or a year. It is sometimes referred to as a statement of operations, income and expense statement or a profit and loss account statement. At the end of an accounting period the business prepares a trial balance. From the trial balance it transfers revenue accounts to the credit of the income statement, and expense accounts to the debit of the statement. The statement now shows the revenue less the expenses for the period, referred to as net income. For a simple business, if revenue is greater than expenses net income is positive and the business has made a net profit, if revenue is less than expenses net income is negative and the business has made a net loss. The statement format for a company for annual reporting purposes is legally defined. However, for management account purposes the layout should be in the format most useful for managing the business. A typical and useful format for management is shown in the example below. The level of detail for each item will depend on your business, and who is using the information. For example, revenue could be broken down by product category, or operating expenditure could be analyzed by either the nature of expenses (advertising, rent etc) or, as shown below, the function of expenses within the business (sales and marketing, administrative expenses etc), whichever provides information that is reliable and more relevant. It should be noted in the above example that the income and expense statement is for a fixed accounting period, (month ended December 31 2018), relates to a past accounting period and shows historical cost information, and may include estimates. Other statement formats are available including those discussed in our posts on the multi-step income statement and the trading profit and loss account. 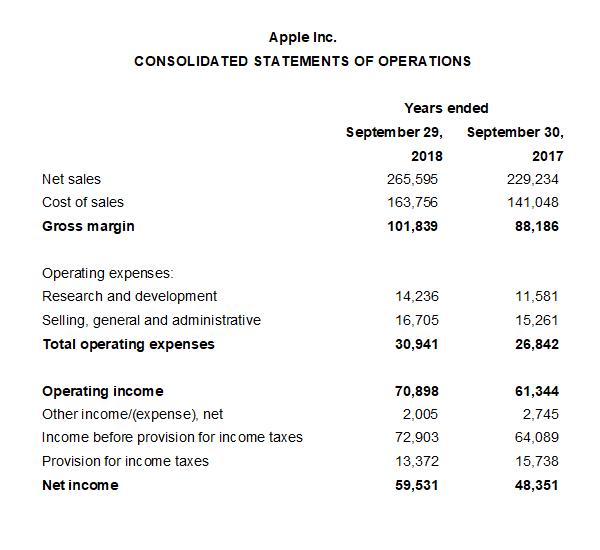 A typical sample statement layout for a publicly listed company is shown in the Annual Report for Apple below. The income and expense statement has nothing to do with cash. It does not show how a business earned or spent its cash, it shows the profit or loss of the business for the accounting period. For example, if on the 1st January a business pays insurance of 24,000 for the year, the cash flowing out of the business is 24,000. However, the monthly statement for January would only show an expense of 2,000 (24,000 / 12 months), as this represents the insurance expense for that month. The Need to Understand the Statement? Management should use the income and expense statement to identify whether the business has a net income for the period. The important figure is the final line net income. It should also use it to establish % relationships between expenses and revenue, to spot trends in operating income ratios, and for comparison of actual results against a budget. They are used by suppliers to decide on whether credit is given as they identify the profitability of the business. Bank Managers utilise the income and expense statement as they base their lending ratios on certain aspects of it, for example Interest cover = Income before interest and tax / Interest paid is used to determine whether the income the business is making is sufficient to cover the interest payments on their loan. The basic statement is used by investors to decide whether to invest or not and at what price. For example they will look at the income before tax to establish their likely return on investment. Any number of people could be using your income and expense statement to make decisions about your business. It is important that you have an understanding of what information the income and expense statement is providing and what that information is telling you.